I hope everyone had a safe and enjoyable Memorial Day weekend. It may feel like summer where you live, but here in the Pacific NW it still feels like spring, so I'm sharing my simple spring mantel. Summer doesn't officially start until June 21st anyway, and since Spring is my favorite season I want to enjoy it a while longer. The area above our fireplace is really difficult to decorate and photograph. It is a recessed area that tends to be rather dark, so I just do the best I can and as you can tell by how often I post, I move at my own pace. I decorate when the mood strikes me. 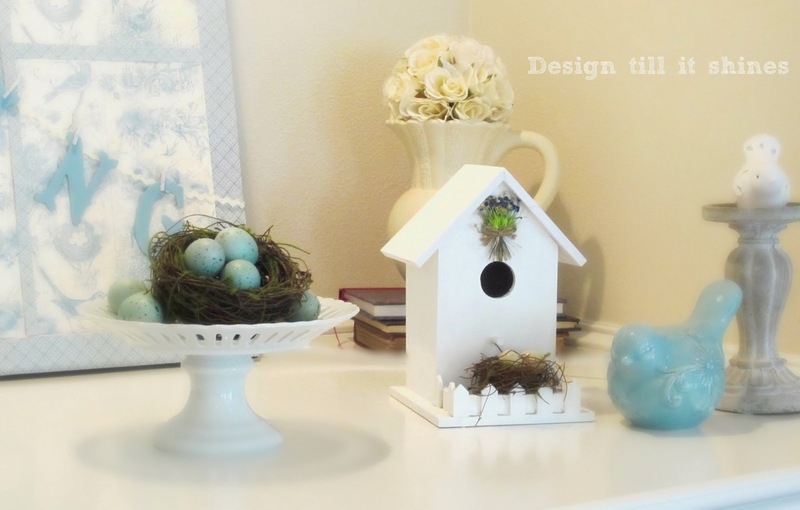 I also keep it as simple as I can by adding birdhouses, nests and some sweet birds to create my mantel display. I knew I wanted the focal point of my mantel to be blue, so I added some pretty birds and nests scrapbook paper to the back of my burlap board and started from there. 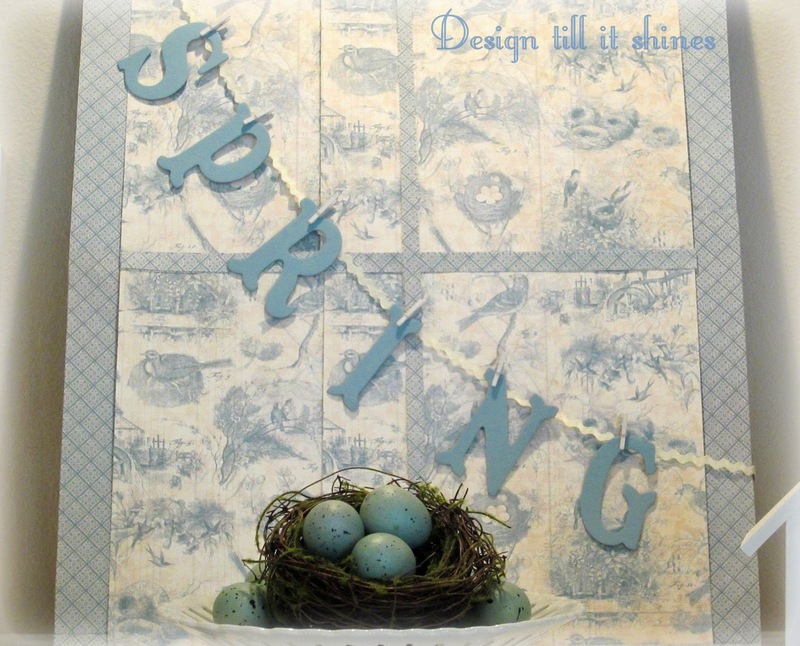 I did the border with the reverse side of my bird paper, so easy and to cover some gaps in my paper I added some strips to create the look of a windowpane. I painted my chipboard letters blue and pinned them onto my rick rack ribbon. Since I needed something low in front so the letters would show, I added a nest with some eggs to a small pedestal. I've brightened the colors up a bit in this pic. I have a tendency to keep my decorations to a minimum and I thought this display filled up my mantel nicely. 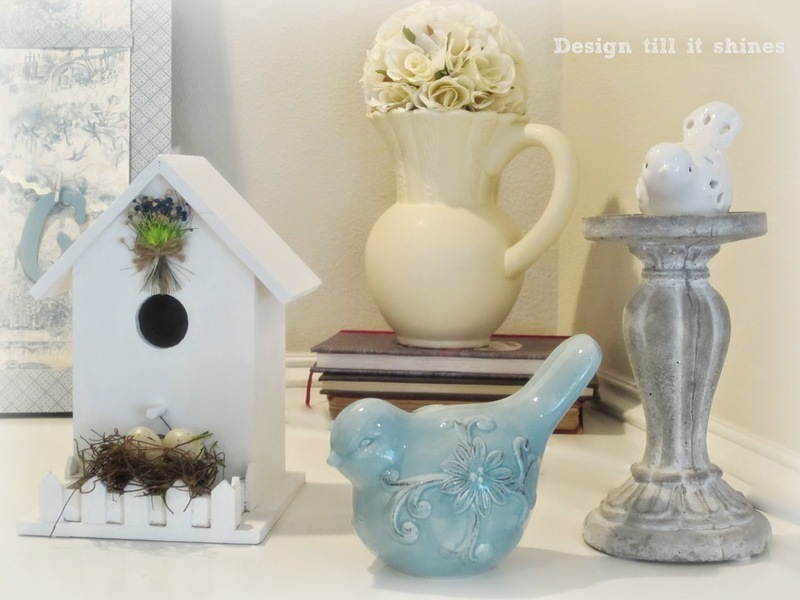 I painted a little birdhouse white and added a small floral bouquet and nest to the front. I added a blue bird I found while thrifting and my vintage pitcher. I found some faux stone candle holders at Joann's awhile back and added those to fill it in a bit. I found the tiny bird house on the stand at one of my favorite thrift stores for a couple of dollars. 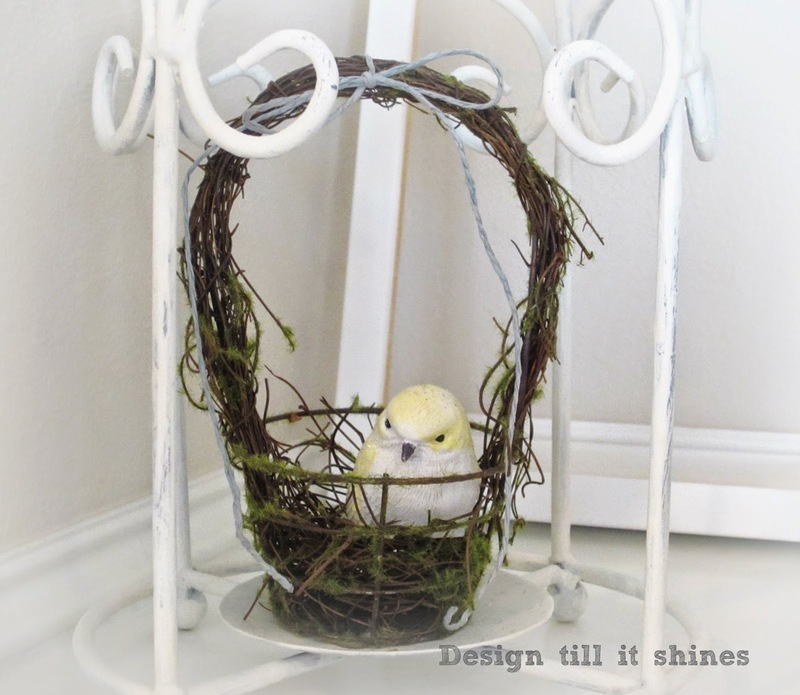 I already had the bird style candle holder and painted it white. I thought it went well with my little birds. 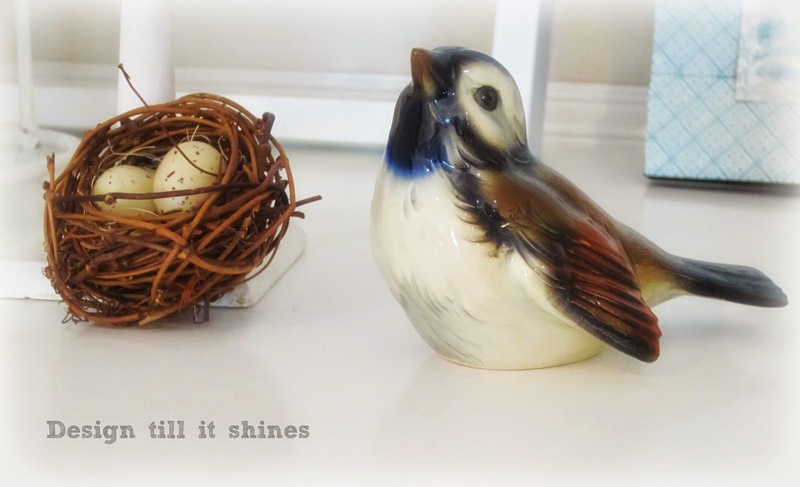 The sparrow is another great find for ten dollars, and is a vintage Goebel. It has a pretty dark blue color on its neck. I love the detail on these birds, lovely markings. They have some pretty blue birds by Goebel that I want to find as well. I might end up starting a new collection! I've shown this bird several times on my blog, it goes so well with everything. I thought it looked kind of cute sitting in the basket. Even though summer is near, I love the cheerfulness of a late springtime display. I'll just tweak it a bit and make it work into summer as well. Blue is such a soothing color and provides a sense of calm. 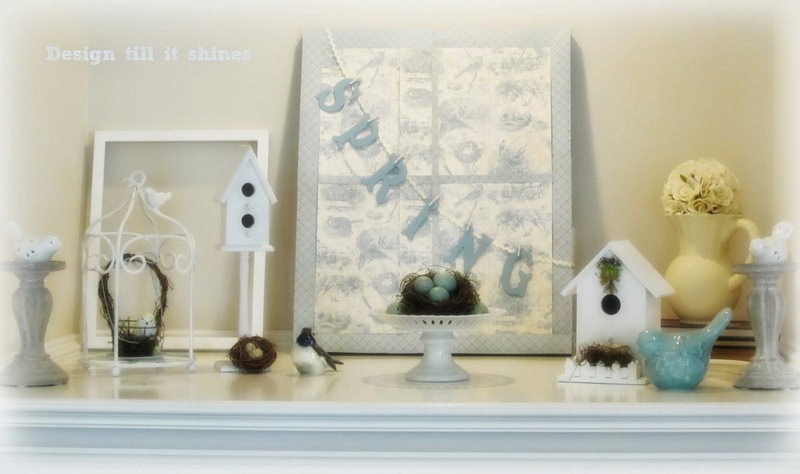 I'm glad I took the time to put my spring mantel together, late as it is, since it's so relaxing to look at. Thanks for visiting! Your spring mantle is pretty. I agree--blue is such a relaxing color. The reason I painted my bedroom blue! Hi Diane! Oh, your mantel looks lovely! I really like your blues and whites! Little birdies always look sweet too. Thank you so much for popping in to see me. 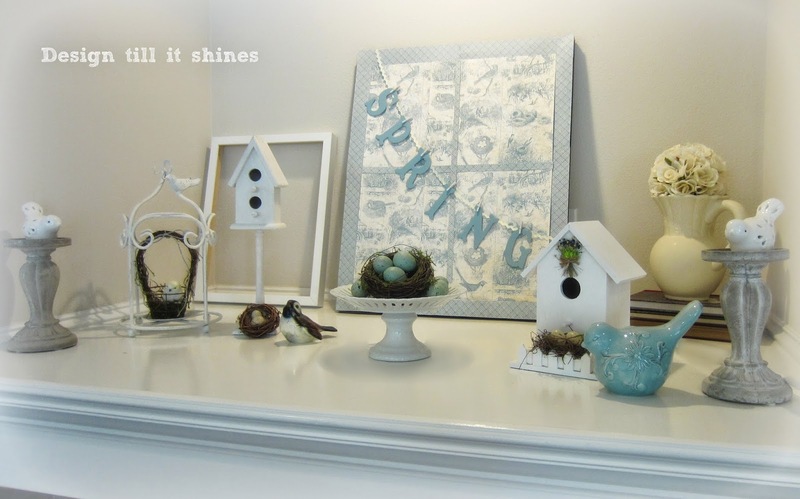 Your Spring mantle is very pretty...love the blue!! 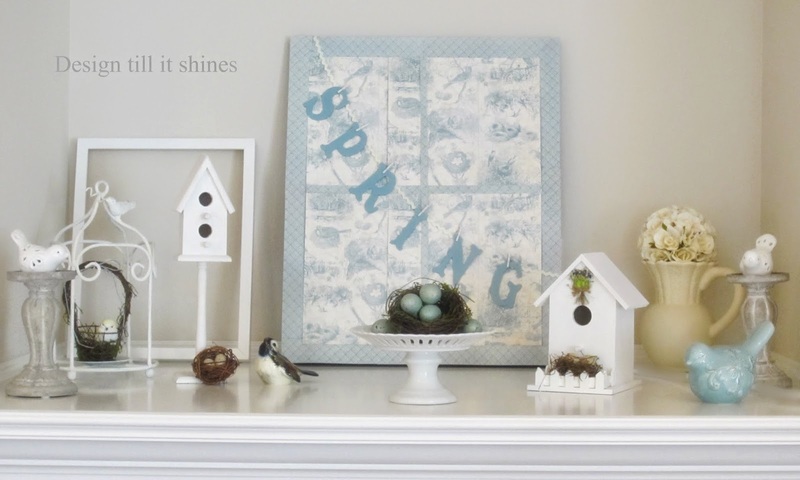 Such a pretty spring mantel! I love the soft shades of blue - so happy! Your mantel is just lovely! 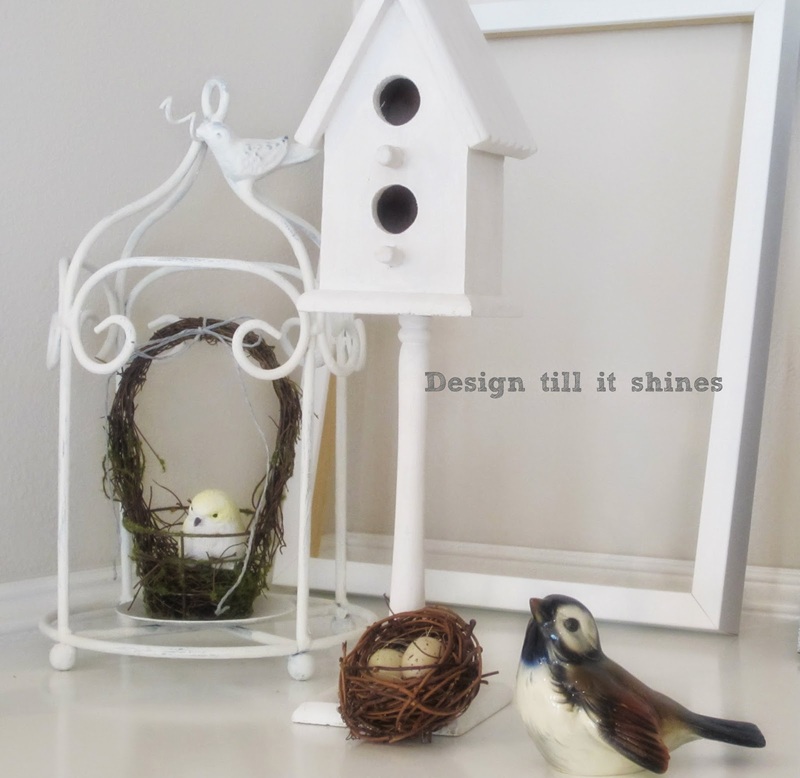 Birds, nests, and houses, .... oh my!!! Love it all, and the colors are perfect. Thanks so much for sharing. Love how clean and crisp and cheerful this arrangement is. What a pretty mantel you have made. I love the blue and white colors. Thanks for linking with Home Sweet Home!